A cool book for the J.League/Japan football/soccer watcher! This listing is for a SUPERB brand new mint book published in Japan for the 2009 J.League season. 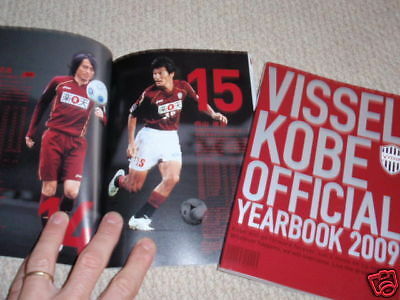 VISSEL KOBE Official Yearbook 2009 is a superb 150 page almost FULL COLOUR book full of pictures, interviews, stats, goods, etc.. One of Kazu’s former teams, currently featuring Tsuneyasu Miyamoto (ex-Japan captain, ex-Red Bull Salzburg) and Kim Nam-Il of the Korea national team. Almost completely in Japanese, of course. A unique collector’s item, for sure! I have fixed postage at $8 – if more I will cover it. Want to spread the word of the J.League throughout the world with some bargains! Postage will be $8 worldwide by airmail or add optional $8 for worldwide EMS insured trackable express. I WILL combine shipping for best rates – just ask! Check my excellent feedback record for peace of mind and happy bidding! SATISFACTION GUARANTEED!! Payment preferred by Paypal. Please add $8 for EMS – trackable, insured express air mail! (Italian buyers MUST add the $8 for EMS). Questions about payment? Please mail me – I am eager to please! Thank you for looking at my listings! Alan, in Kobe, Japan. Thanks for looking at my auctions. Alan, in Kobe, Japan – supplier of high quality Japanese film and music memorabilia since 1990! !